In younger patients affected by arthritis, it is preferential if possible to retain the patient’s own knee. In selected cases, where arthritis predominantly affects the inner (medial) aspect of the knee, a procedure to re-align the knee can be undertaken. This technique moves the mechanical (weight-bearing) axis of the knee, away from the arthritic painful side towards the outer (lateral) non-arthritic side. 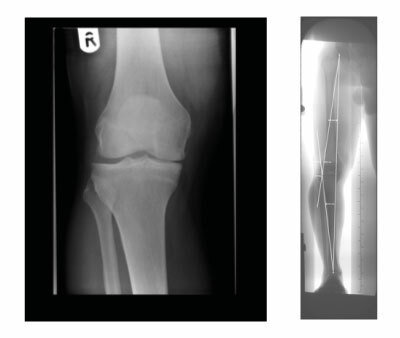 These pre –operative x-rays show arthritis affecting the inner aspect of the knee and a limb alignment x-ray showing the mechanical axis passing through the inner aspect of the knee. 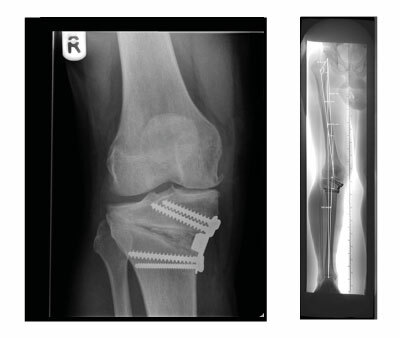 These post-operative x-rays show the knee following re-alignment surgery and how the mechanical axis has been moved to the outer aspect of the knee, taking the pressure off the inner arthritic aspect.